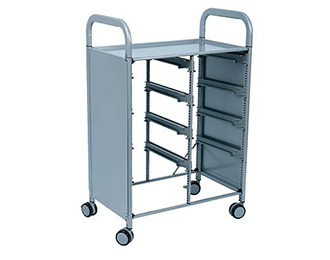 Movable storage rack cart designed for Gratnells® trays (sold separately). With this 2-column rack system, you can transport materials to and from the classroom. It includes large castors with brakes for added stability. An ideal way to store PASCO sensors & equipment, this rolling cart ships with a 16 pairs of runners so that you can configure it for whatever size trays you need. This cart can be used to store the equipment kits from the Essential Physics or Essential Chemistry curriculum, the storage trays we offer for Wireless Sensors, or any of the four sizes of empty trays that we offer for whatever you would like to store. Stores up to 8 Gratnells® F2 trays.